Home / APPLICATIONS / How to Safely Recover Dust form Insulation & Vermiculite? How to Safely Recover Dust form Insulation & Vermiculite? The treated vermiculite becomes a light-weight, fire-resistant, absorbent, and odourless material. These properties allow vermiculite to be used to make numerous products, including attic insulation. Vermiculite attic insulation is a pebble like poured in material and is usually light brown to gold in colour. Sizes of vermiculite products range from very fine particles to large (course) pieces nearly an inch long. It is also common to find vermiculite as loose fill insulation in outside wall cavities including concrete block walls. Vermiculite has been an established commercial commodity for well over 50 years, and is currently used throughout the world. Of concern is the vermiculite ore produced by the Libby Mine in Montana from the 1920's to 1990. During this period, the Libby Mine accounted for more than half the worldwide production of vermiculite. The type of asbestos contamination present is tremolite, a particularly hazardous form of asbestos and the concentration ranges from 0.3% to 7%. 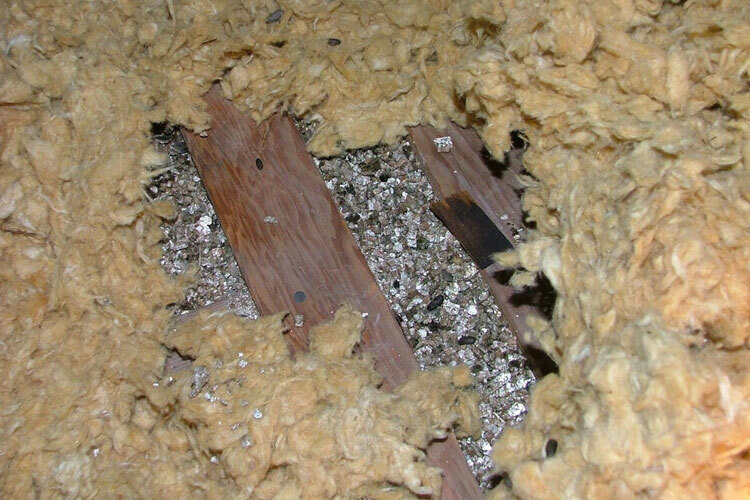 Asbestos is a definite health hazard because the very tiny indestructible fibres float into your lungs and stay there, eventually causing cancer type growths. Which Industries are at Risk with Vermiculite?